The IoT and IIoT (Internet of Things and Industrial Internet of Things) acronyms indicate all those technologies that make it possible to transform any object, be it a sensor, an actuator, a vehicle or an appliance, into a device connected to the Internet, which is in able to send data to the cloud using light and fast protocols such as MQTT (Message Queue Telemetry Transport). The increasing trend to use cloud applications has pushed SCADA technologies to evolve towards integration with the Internet of Things. 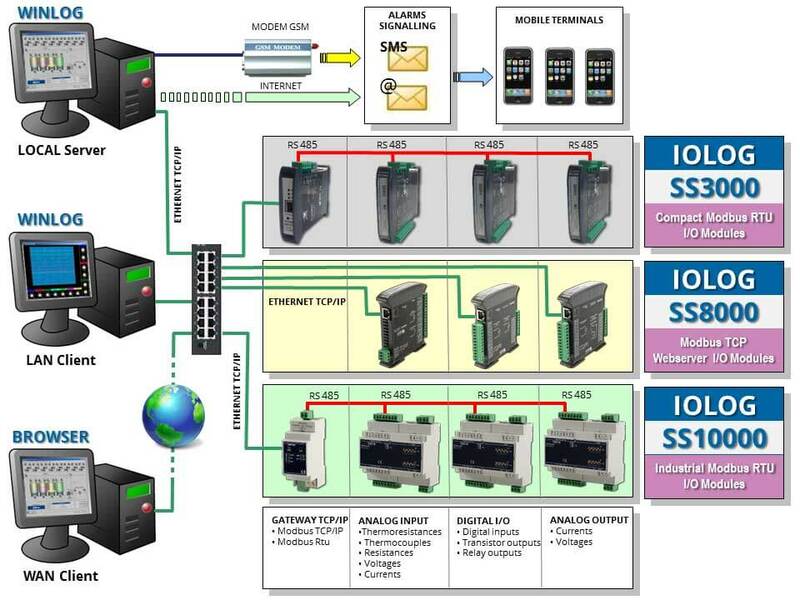 In fact, SCADA systems can increase the potential of the Industrial Internet of Things. By integrating the two technologies, you can get a much faster, more detailed and even more safe collection and verification of company data. quality control at the production system level and related processes. 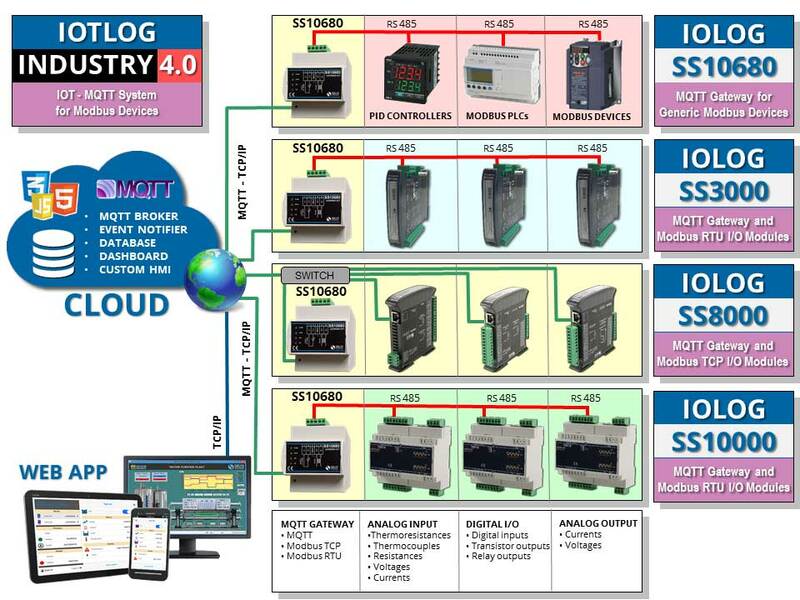 These systems include the key enabling technologies (Key Enabling Technologies - KET's) of Industry 4.0 (SCADA, IoT, cloud, big data, cybersecurity). SCADA applications are used today in most industrial fields and are an indispensable aid for all companies, regardless of size and sector of activity. SCADA software is the most suitable development environment for the easy and intuitive creation of complex SCADA applications. Provide a large amount of information. All system status information, both acquired from the field sensors and provided by real-time control devices (PLC), is collected, saved and made available for further processing, aimed at quality control, efficiency gain and production optimization. Provide a synthetic and clear picture of the production plant. A series of templates, that are part of the human-machine interface (HMI), provide the operator with a graphical picture of the whole process, its evolution over time and the unexpected deviations (alarms). By this way all information relevant to the process are translated into a visual language of easy understanding for the operator. Can grow and adapt easily to the growth of the company. The modular and flexible structure of SCADA software makes it possible to adapt to the different situations that arise when the company needs to grow or change, to respond to the challenges of a globalized market. The SCADA software includes, for example, all the development tools that allow to modify the SCADA application in order to provide communication with new devices, in a context characterized by a variety of transmission media and different communication protocols. Allow centralized control of remote units. Many companies, especially those that manage public service networks (water, electricity, etc. ), are characterized by a structure distributed throughout the territory, which traditionally requires the fixed or programmed presence of technical staff for operation and maintenance. The SCADA application ensures remote control of peripheral units and allows technical staff to access all information with a simple browser. SCADA software is an integrated development environement which allows creation of SCADA HMI applications. Several SCADA software from various manufacturers are available, with significant differences in price and performance. 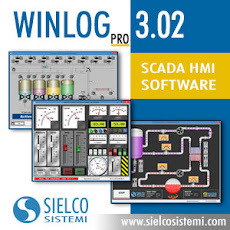 The choice of the SCADA software most suitable for the application to be developed depends on several factors, as well as personal preferences, but is generally based on the complexity of the project, the required performances, any constraints imposed by the client and the available budget. You should also consider the learning time, which is usually higher in case of a more complex SCADA software. As a general rule, the choice of a complex SCADA software is justified when the project involves a large and high-cost plant, for which software cost and learning time are no longer relevant. in the case of small-to-medium projects with a limited budget, it is advisable to move towards SCADA software that have a lower cost and require a shorter learning time. Communication: a set of development tools and communication drivers to interface with most of electronic devices (PLCs, controllers, meters, etc.) from various manufacturesrs operating in the Industrial Automation market. It allows to build the DB of the variables to be exchanged with external devices and includes the most common communication protocols such as OPC, Siemens, Omron, Allen Bradley, Modbus RTU, Modbus TCP, KNX, Bacnet, etc. Human Machine Interface (HMI): a set of development tools and graphic libraries to create static and animated templates. 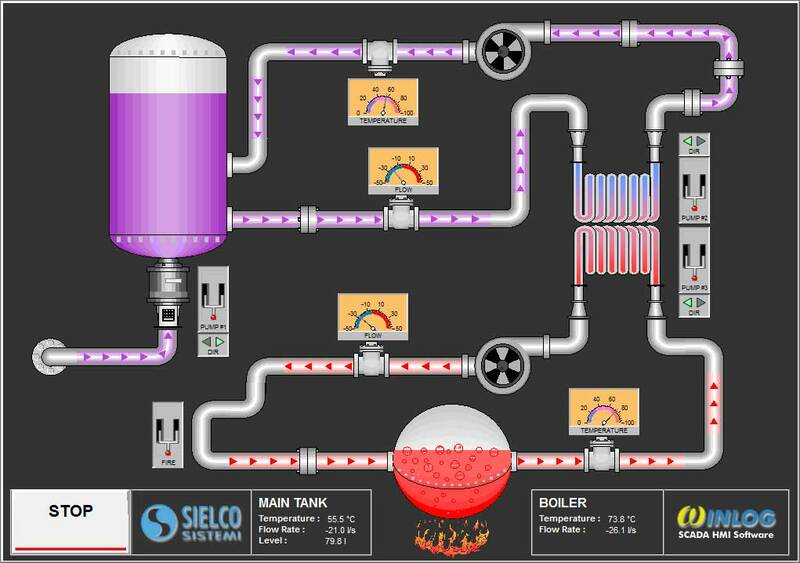 It is important to underline the importance of graphics in the development of a SCADA application. The human-machine interface (HMI) is in fact all the more effective, the more it is able to provide the operator with a prompt and complete image of the whole process, highlighting the status, the evolution and the unexpected deviations (alarms). Process information: a set of development tools to allow the operator to have all the information describing the current status of the process (online data) and its evolution over time (historical data). For example, to allow the operator to be promptly notified in case of malfunction or to analyze the graphical trends of the monitored and recorded process variables. Reports: a set of development tools to sort and process the information acquired from the process in order to generate reports for production and quality managers. Reports usually refer to a specific production batch, highlighting its characteristics and certifying its compliance with the requirements. Data acquisition not only means transfer of information from peripheral devices to supervisory computers, but also transfer of information in the opposite direction, in order to allow the supervisory system to control the process, that is to direct its evolution by modifying the values of the variables that condition its operation. We can say that data acquisition is the main function among those performed by SCADA systems. In fact, by putting the process in communication with the supervision, data acquisition makes it possible for the supervisory system to get all the information on the process status that are necessary to allow the observation of the process itself. The task of data acquisition is to ensure the error-free transfer of information between process and supervision, in a context characterized by a variety of transmission media and different communication protocols. The control function of a SCADA system consists in the ability of the control system to interact with the controlled process, in order to modify its evolution according to pre-established rules or decisions taken by the operator. It is important to underline that, with “control of a SCADA system, we do not mean “real time process control”, usually the prerogative of the PLC, but rather the ability to modify the evolution of the process, for example by sending a different work recipe. To better clarify the concept, we can say that, with reference to a particular process temperature, the task of a real time control is to keep this temperature unchanged (by acting on the appropriate actuators), while the task of the SCADA control is to fix the temperature at which the process should work (by sending the appropriate set point). Supervision is the function that allows the operator to have an immediate view of the process status and to control how the process evolves over time by analyzing the sequence of operating states. The main task of the supervision is to realize the human-machine interface (HMI). To be effective, the HMI must provide the operator with a prompt and complete image of the whole process, highlighting the status, the evolution and the unexpected deviations (alarms). 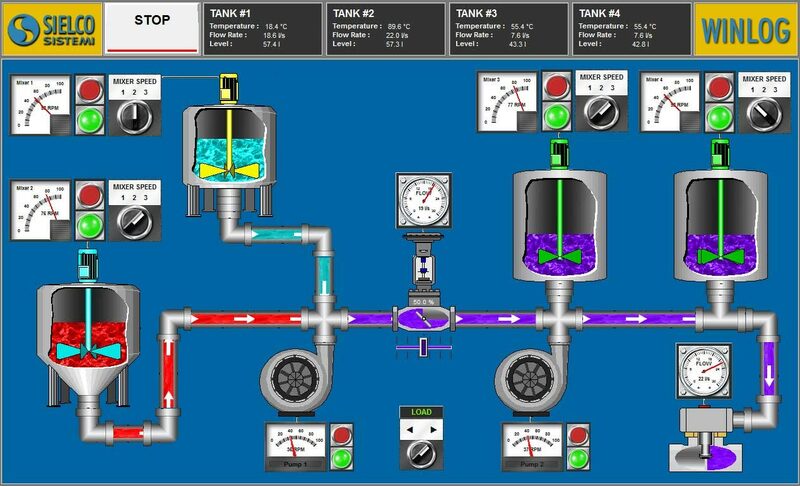 For an effective HMI, the graphic representation is of great importance, since it translates information relevant to the process into a visual language of easy understanding for the operator. For example, you can display the status of a pump through a graphic symbol with different colors, the change of the value of a pressure through a graphical trend, the occurrence of an alarm through a pop-up window. The word SCADA means “Supervisory Control and Data Acquisition”. The definition clearly explains what are the functions and objectives of a SCADA system, namely supervision, control and data acquisition.